This is a post from our deprecated Fashion Blog. I started to miss it, so am reposting it here. This is not a press release (although they do have one). It's pure word-of-mouth, or word-of-Net these days; I got this link from another board. 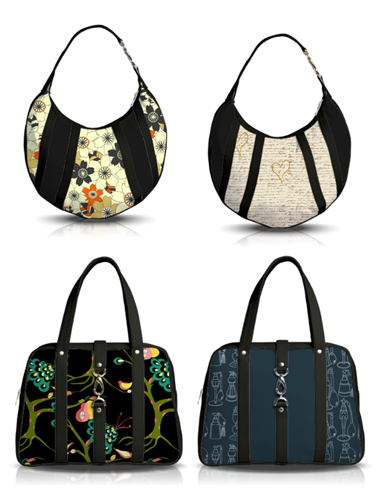 They do have a completely interactive bag-designing website...which I can admit I thought would be a bore. I'm not a bag person, I loathe all-Flash websites in the main, who needs to spend time designing a bag...et cetera. When I got there I realized the bags were good. Started out with the fine intention of making a bag from each designer on the site...about six bags in, I realized this was not a good idea at 3 o'clock in the morning. So, the samples above are just from the first 8 designers. They have solid colors too, will soon have more selection...all-leather bags and so forth. They have some special bags to benefit charitable causes. I will emphasize again that there are many other designers and their patterns, many ways of putting together "your" bag. You may email "your" bag to your friend for her to critique, as well. Most intriguing of all, according to their press release, these bags are made in the U.S.A. I had to read that two or three times for it to sink in. There is not much about that fact on the freddy&ma site, which I think is a mistake. There is an enormous, not-talked-about-much sentiment for Americans to "buy American." Not just American designers (but thanks anyway), but especially American labor. The price range is in the two to three hundreds, which admittedly is more than I pay for a bag; however, I will guess the quality of these bags is up there with the (far more expensive) imported designer bags. Dims: 14.5" x 13" x 4.5"
These are fun to browse, but I wish they offered customizable leather bags. But I suppose that's much harder to do and more expensive. Definitely. I don't do cloth bags myself, they don't wear as well as leather, they tend to get dirty easily... 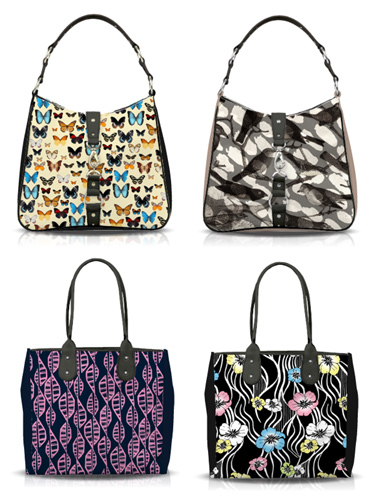 I think their original idea was to use designer prints, but it wouldn't hurt to develop custom leather bags.